Some say Richard C. Hoagland started the "life on Mars" controversy in 1987 when he published his book "The Monuments of Mars." Others link it to a day in 1996 when it was announced that a Martian rock found in Antarctica appeared to contain fossilized remains of tiny living organisms. But history buffs know that Percival Lowell, a 19th Century American astronomer, was among the first to propose that living intelligent creatures occupied that planet. It was in 1895 when Lowell, peering through his telescope near Flagstaff, Arizona, observed straight lines on the planet's surface that he perceived to be canals. Hoagland, however, stirred the imagination of people all over the world after he got his hands on a photograph snapped in 1976 by NASA's Viking Orbiter as it circled the red planet. With some computer enhancement, the photograph showed a mile-wide rock that appeared to be shaped like a human face. The same picture included nearby formations that were both square and pyramid shaped. Hoagland suggested they were the ruins of an ancient city. Close examination of the area, located in a place known as the Cydonia region of Mars, indeed reveals anomalies that suggest that an intelligent life once built massive structures. 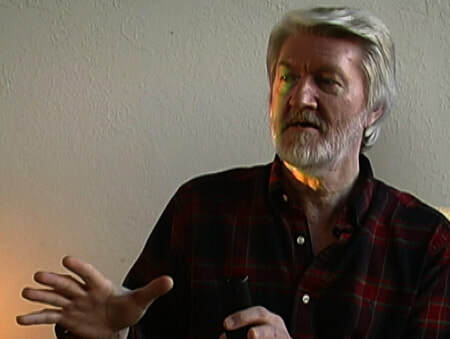 Among the most prominent are a large five-cornered pyramid, numerous smaller pyramids, a square form that Hoagland called "The Fort," and several other structures that comprise what he identified as "The City." Hoagland noted that the buildings show extensive structural damage, mostly from centuries of erosion and decay. But he believes the large five-cornered pyramid has extensive damage on one of its sides from what appears to have been a powerful explosion. He reported a 1000-foot wide crater next to its base, indicating that the area might have been under attack by foreign forces. Hoagland's ideas received a lot of publicity, but until recently, few others stepped to the plate to give him any support. Everything changed after Marlin Space Science Systems released images from the Mars Global Surveyor, which later orbited the planet. These pictures give exciting new evidence that intelligent life not only lived on Mars in the past, it may still be there! 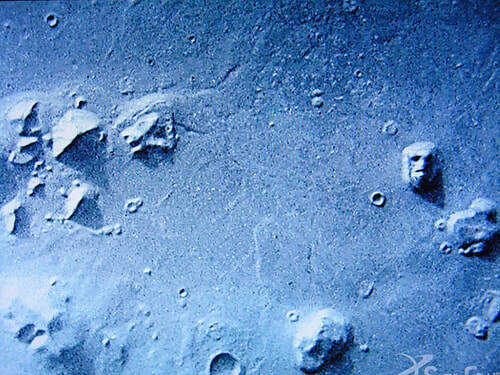 --New and improved images of the controversial Cydonia Region that give a more detailed and somewhat frightening new version of the face. While somewhat humanoid, it also has a strange alien appearance. --Discovery of over 120 sites where gullies and sharp cuts in the surface indicate the existence of flowing water in the very recent past. The planet's topography shows that the Northern Hemisphere is unusually low and flat, indicating that an ocean once covered that half of Mars. --Small ice caps at the two poles that may or may not consist of frozen water. --Alterations of color on rocks, that sometimes shift from brown to hews of green and blue suggesting that simple plants or lichens grow on the rocks and react to changing biospheric conditions. --First photos shot by the Pathfinder land rover on the planet's surface that showed a blue sky. Hoagland noted that within minutes "adjustments" were made to the equipment so that the sky was altered to appear black and the ground shifted from brown to a reddish hew. He believes NASA was not expecting the pictures to show a blue sky and got caught off guard. He suggests on his web site that someone was ordered to change the color of the images. --Additional anomalies next to the southern ice cap that appear to be the ruins of more buildings and possibly another city. The structures are large, straight lined, and squared in shape. --Yet another interesting discovery were cracks on the surface in the Northern Hemisphere reveal some unexpected "tube-like" structures passing along the bottom of some of the deep crevices. Famed scientist and science fiction writer Sir Arthur C. Clarke said the tubes which reflect sunlight as if they were made of glass and seem to show ribs or supportive framework, are among "the most incredible images ever to come from space." In an interview with SPACE.com Clarke said he believes the pictures "are pretty convincing proof of the existence of large forms of life on Mars . . . I don't see any other interpretation." More recently, a photo snapped by NASA’s Curiosity Rover depicts an unusually shaped mound high on a hill in the distance. Scott C. Waring, who maintains a daily blog of UFO sightings, suggests this mound, because of its shape, may be a crashed UFO. He notes that the disk is partly buried in the surface of the hill. It measures about 40 meters in width. Then a new report by a team of geophysical sciences at the University of Chicago claims evidence that Mars was once literally inundated with water that flowed in great rivers wider than the Mississippi. The team, headed by Professor Edwin Kite, published its findings in the journal Science Advances in the March 27 edition. Using data from Curiosity Rover, which has been exploring and sampling the Martian landscape since 2012, the team believes Martian rivers flowed intermittently but intensely over a 4.5 million-year history. So where did all of this water come from, and where and why did it disappear? These appear to be questions still unanswered as research teams continue to study the planet’s climate history. NASA plans to launch a new rover in 2020 that will be making a specific study of an ancient river delta inside the Mars Jezero Crater. And as in earlier rover studies, the search continues for evidence of life on the red planet. Finally there is another strange twist to events surrounding NASA's Martian adventures. A U.S. spy research team, called the National Imagery and Mapping Agency (NIMA), recently disclosed that after spending months examining the Global Surveyor pictures, has found what appears to be the lost Global Lander. This craft allegedly crashed landed near the Martian South Pole in December, 1999. Now the agency says the lander appears to be resting on its four extended legs as if it made a proper landing. The loss of the Global Lander appeared to have been a major embarrassment for NASA at the time of its disappearance. But Hoagland suggested that its recent discovery by a spy organization suggests that our government might have turned the lander's cameras off after it landed. He believes the mission was declared a failure for other reasons. Hoagland suggests that the lander dropped amidst some kind of plant-like objects that have since been photographed by the Surveyor from miles overhead. These pictures, which also have captured the imagination of Clarke, suggest that something alive has been found on the planet's surface. "We have to say that if nothing else, the contents of this image are something extraordinary," Hoagland wrote. "Whatever this is, it resides in the South Polar regions just a hop, skip and a jump from the designated MPL (Mars Polar Landing) site. "And certainly, if this is at all indicative of what's to be found below the receding ice of the South Polar caps, then it is easy to see why somebody at NASA would decide that it was a little too soon for the public to get a first-hand look at it . . . and pulled the plug."